Sorry that I’ve been neglecting this blog, but things have been busy and it seems there’s always something to do. In the past few months, we sold our condo (thankfully! ), moved into a new (well, a rehabbed 100-year-old) house in Chicago, transitioned to a new neighborhood after 20 years in the old ‘hood, and changed our daughters to a new school. Things are settling down now, and we are enjoying Hanukkah in our new home. And while Hanukkah may mean candles, dreidels and gifts to the kids, it means potato latkes to me. 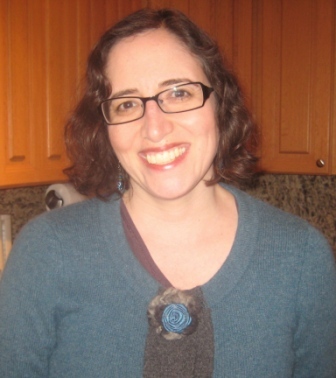 Many homemade and store-bought latkes contain flour or matza meal. 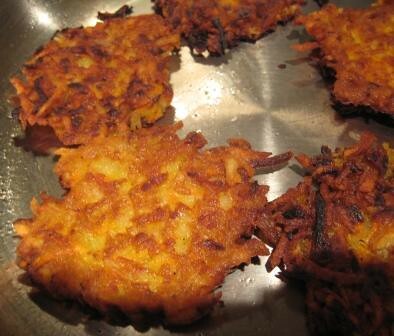 However, since the amount of flour is small, it’s pretty easy to adapt latkes to be gluten-free. If you’re looking to buy latkes, Kineret frozen potato latkes do not contain gluten. This year, my family concurred that my latkes were the best ever. 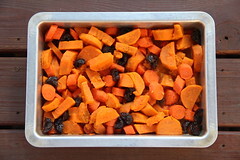 I used three russet potatoes and one sweet potato, which added a golden orange color and hint of sweetness. After I grated the potatoes, I let them sit in a colander to drain extra liquid. And I used potato starch instead of flour. Don’t listen to people who claim you have to hand-grate the potatoes; a food processor works just fine. Even if your arteries harden at the sight of a thick layer of oil in a frying pan, don’t be stingy with the oil. To make the latkes brown and crisp, you need a generous layer of oil covering the bottom of the pan. Keep the pan hot to prevent the latkes from absorbing too much oil, but not so hot that you set off the smoke alarm. Enjoy the remaining days of Hanukkah! Using the top shredding disc on a food processor, grate the baking potatoes, sweet potato and onion, alternating grating the potatoes and onion to prevent the potatoes from darkening. Transfer the potato mixture to a large bowl, change to the bottom chopper blade on the food processor, pour half of the potato mixture back in the food processor bowl and pulse just a few times to end up with shorter bits of potato instead of long strands. Transfer potato mixture to a colander or strainer to drain for 5 to 10 minutes. Squeeze out as much additional liquid as you can by pressing down on the potatoes with paper towels. Place strained potatoes in large bowl, and mix in eggs, potato starch, salt, pepper and baking powder. If the mixture seems very loose and watery, add a bit more potato starch. Pour canola oil into two frying pans, so that there’s ¼ inch of oil covering the bottom of each pan; heat over medium-high heat. To test if oil is hot, sprinkle in a drop of water; if the water sizzles then the oil is ready. Drop large spoonfuls of potatoes into the pan. Flatten pancakes slightly with spatula and fry until golden brown on the bottom, then flip and cook the other side. The smaller the latkes are, the crisper they will be. Repeat with remaining potato mixture. Place the latkes on a paper-towel-lined cookie sheet to drain excess oil. Keep them warm in a 250-degree oven while you make additional batches. Serve hot with applesauce and/or sour cream. For a healthier twist, use nonfat plain Greek yogurt instead of sour cream. Great post, Eve. Thank you. I thought of you last week, when we were hosting a small dinner party. We had one guest who was on a gluten-restricted diet and another who’s a vegetarian. A challenge. But we made it through — successfully. Thank you for what looks like a recipe for delicious latkes. I will be having a Chanukah party tomorrow and all my favorite people are invited. I can hardly wait to share.